Nutmeg enjoyed its sovereignty as worth its weight in gold in the European kingdom since the prehistoric period, especially for its effectiveness in treating plague. More than just a cheap and cheerful spice, Nutmeg has innumerable health benefits and can leave you in awe if you get to know its immense healing values. Indigenous to the Banda islands in the eastern Indonesia, this evergreen tree takes nearly 20 years to groom itself into a fully mature tree for fruiting. The essential oil of Nutmeg is extracted by steam distillation method from the hard egg-like seeds of its fruit. Popularly known as Jatiphala in India, the birthplace of Ayurveda, Nutmeg and its essential oil have been used for treating fever, respiratory problems, headaches, digestive disorders, pain, bad breath, convulsions, inflammation and sleep disorders. History has a handful of things to talk about this magical herb also known as magic for its mind-blowing assistance to healthiness. Nutmeg was one among the most expensive herb in the European countries after being proved as a potential remedy to ward off plague in the Elizabethan times and was also used as a medicinal, preservative and flavoring agent. Botanically known as Myristica fragrans, Nutmeg slowly spread from Indonesia to Malaysia, India and other parts of the world including the Caribbean islands. Nutmeg has its name etched in the works of the Roman writer, Pliny during the 1st century and in the medicinal book written by Hildegard of Bingen, the first herbalist of the middle ages. It was initially the Arabian sailors who traded this herb to the Venetians and introduced to the Europeans in the middle ages. Nutmeg was used to treat liver diseases and impotence in the Traditional Chinese Medicine. Ancient Arabians used it as an aphrodisiac and Nutmeg was used in the treatment of depression and anxiety in the Homeopathic medicine. Egyptians used it for embalming and was used as incense by the Romans. It was also used as an ointment for treating hemorrhoids in the middle ages. Nutmeg is believed to be a symbol of health, money, loyalty and luck. According to the Gas chromatography report, Nutmeg oil constitutes of 25 chemical components that contribute to its fragrance, therapeutic attributes, consistency and quality of this oil. Of which, Sabinene contributes to the highest proportion of Nutmeg oil with about 24.0% of its total composition. I trust that this must certainly help you in getting to know the exclusive information about the prime chemical constituents of Nutmeg oil. The table crafted below clearly depicts the unique nature and contributions of these bio-chemical constituents to the healing magnificence of Nutmeg essential oil. The remedial properties of this oil are antiseptic, digestive, laxative, emmenagogue, analgesic, anti-rheumatic, stimulant, carminative, antispasmodic, parturient, tonic, sedative, bactericide, anti-inflammatory and relaxant. Known as Jaiphal in Hindi and Jatiphala in Sanskrit, Nutmeg is always a part of the spice boxes in every Indian kitchen. 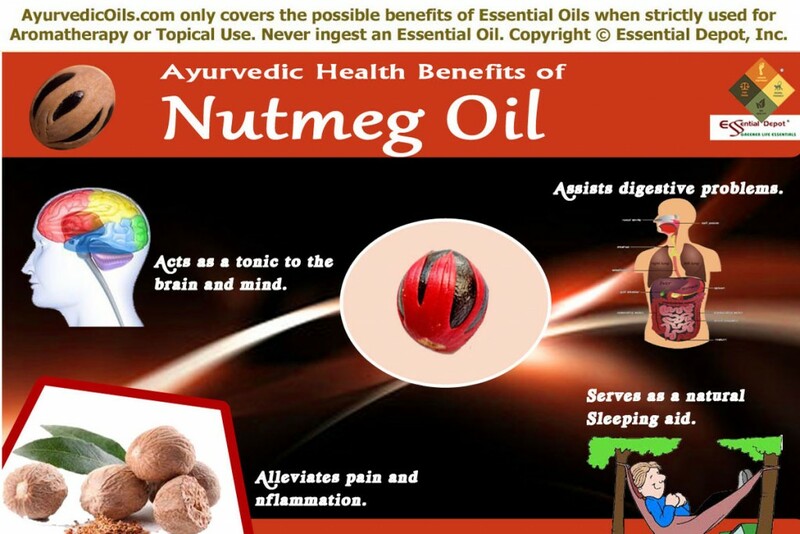 Nutmeg is one among those Grandma’s remedy for treating indigestion, cold, fever and headache. Even today, many people take whole Nutmegs just like candies as the fresh juice of this herb is said to ease the difficulties in respiration and absorption. As a naturally warming spice, this herb is used in Ayurvedic cooking along with other spices like bay leaves, black pepper and cinnamon. Ayurvedic texts suggest the use of a pinch of Nutmeg powder in warm milk before going to bed to calm the nerves, stimulate the system and promote peaceful sleep. There are other numerous Ayurvedic remedies using Nutmeg and are still practiced in India. Ayurveda is celebrated as the mother of all healing sciences mainly because of its healing wisdom since 5,000 years. This noble discipline trusts in healing an illness after identifying its root cause and aims at preventing it in the future. Ayurvedic treatments are unique for every individual based on their specific set of energy elements known as doshas. The three types of doshas are vata, pitta and kapha. Vata represents air and controls metabolism, blood circulation, nervous functions, heartbeat, respiration, muscular movements, functions of the brain and eliminations from the body. Pitta stands for fire and governs digestion, thinking potential, body temperature, vision, mental and physical strength. Kapha stands for earth and is responsible for muscular strength, stamina, energy and the power to repair and recover from illnesses. Every individual will have a predominance of any one of these doshas and imbalance between these doshas cause sickness. Nutmeg herb and its essential oil is said to increase pitta thus assisting in digestive problems and pacify kapha and vata imbalances. Pitta dosha is responsible for the digestive fire that aids in problem-free digestion and Nutmeg essential oil has the power to increase pitta thus helping with indigestion and other problems with digestion. Adding 5 to 6 drops of Nutmeg essential oil in warm bathing water or massaging your tummy with 3 drops of Nutmeg oil blended with warm sesame oil can aid in treating loss of appetite, nausea, diarrhea, flatulence, constipation, chronic vomiting and gallstones. Bad breath or halitosis is not just an oral problem; it may be due to intestinal ulcers or harmful toxins in the body. Nutmeg with its antibacterial properties aids in killing a number of harmful bacteria in the mouth and helps eliminate the toxins from the body. It soothes the stomach and intestines and assists in controlling bad breath and foul smell. Add 2 drops of Nutmeg essential oil in a cup of lukewarm water and use it as a gargle to assist with bad breath. You can also add 2 drops of this oil to your diffuser to regularize your metabolic functions and refresh your aura. Nutmeg essential oil augments the brain power and aids in improving concentration and memory skills. The presence of the chemical component myristicin in this oil has been proved to enhance memory power and restrain the growth of an enzyme in the brain, which is responsible for Alzheimer’s disorder. Inhaling the unique spicy and musky aroma of Nutmeg essential oil by adding 2 drops to your diffuser or to your hankie can bring in self-confidence, encouragement, efficiency and spontaneity. This aids in enhancing your performance at work and in studies. Adding 4 to 5 drops in bathing water helps alleviate stress, fatigue, anxiety and mental exhaustion by stimulating the functions of the brain and the sensory nerves. The deep and enriching aroma of Nutmeg oil has a thoughtful impact on our feelings and emotions. Using 2 drops of Nutmeg essential oil in your diffuser during meditation will grant you the power to resist, recover and relive your life’s most meaningful moments. 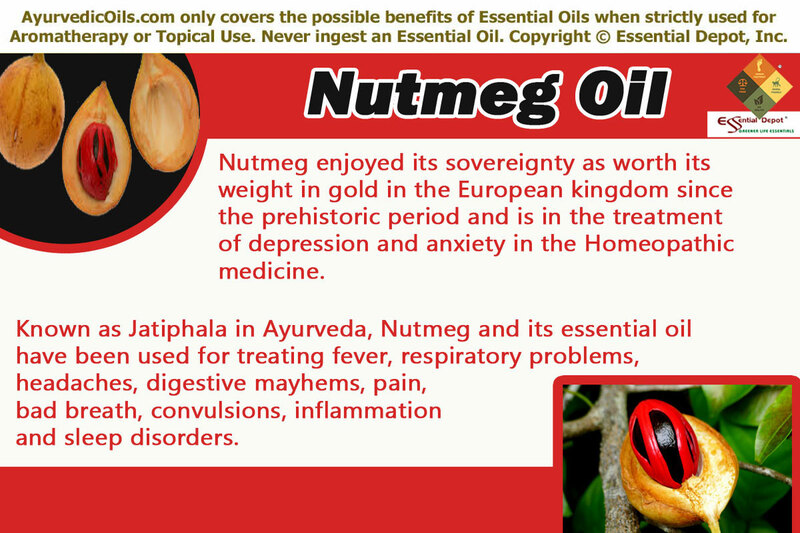 Nutmeg essential oil is banked upon for its effectiveness in relieving all kinds of pain and inflammation in the body. When gently massaged onto the affected area with 2 to 3 drops of Nutmeg oil along with coconut oil, it is known to enhance blood circulation and clear the blocked passages causing pain and swelling. With all these powers, Nutmeg is yet another perfect choice for treating rheumatic pain where pain, inflammation and improper circulation join hands with. This oil is also helpful in treating muscular pain, nerve pain, gout, arthritis and rheumatic pain when applied topically or used in hot compress. With its emmenagogue properties, this oil aids in normalizing irregular periods, blocked menstruation, pain, fatigue and nausea during menstruation. All you need to do is to put on 4 drops of Nutmeg oil to your bath tub or massage gently on your abdomen along with sesame oil for instant relief. It is also known as an effective oil for treating toothache, strengthening gums and reducing the swelling due to toothache with the presence of the eugenol component. Add 1 drop of Nutmeg oil to cotton swab and apply it around the gums of the aching tooth. Nutmeg has been used as a natural sleeping aid for centuries together for its soothing, sedative, calming and relaxing properties. When massaged gently on your body with 5 to 6 drops of Nutmeg oil along with coconut oil followed by a warm bath with 3 drops of Nutmeg oil in your bath tub can help you in calming your senses, alleviating depression, soothing your nerves, enhancing your blood circulation, improving the quality of your sleep and making your dreams more passionate and vibrant. You can also add 2 drops of Nutmeg oil to a tissue and place it besides your pillows for inducing peaceful sleep. Nutmeg essential oil is also effective in treating frigidity, impotence and is said to increase the libido in both the sexes. It also aids in treating kidney infections and helps dissolve kidney stones. Nutmeg is also known as a liver tonic and aids in eliminating the toxins from the liver. It is also effectual in treating cold, cough, fever and other respiratory problems like asthma. You can add 2 drops of this oil in steam inhalation for effective relief from respiratory problems. Nutmeg essential oil is also used in making soaps, cosmetics, incense, perfumes, after shave lotions, vicks vaporub, cough syrups, breathing inhalers and dental creams. 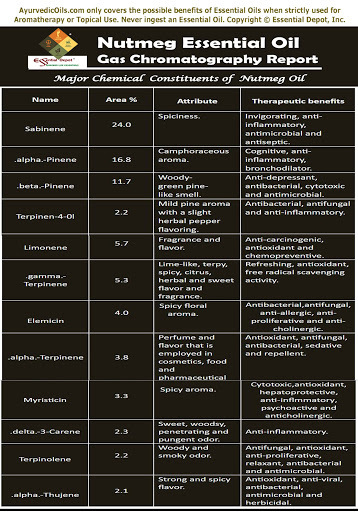 Never use essential oils internally and always dilute in suitable carrier oils before using it topically. Nutmeg essential oil is abortifacient in nature and should strictly be avoided by pregnant women. This article is only for informational purpose and is not meant to replace any prescription drugs or professional advice. Always consult your Ayurvedic practitioner before using appropriate essential oils for your specific health conditions. The MSDS (Material Safety Data Sheet) of Nutmeg oil is readily available for your enhanced safety and better usage. 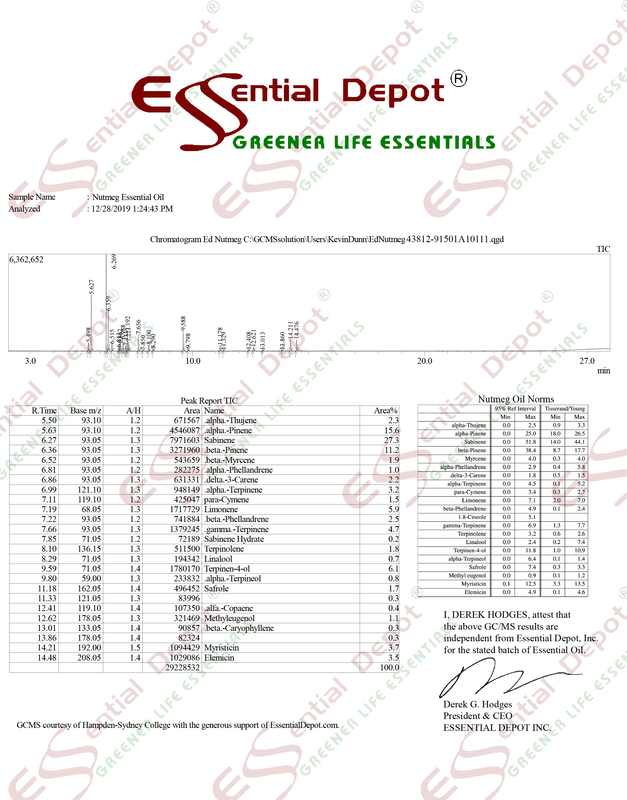 Gas Chromatography Report (GC analysis) of Nutmeg oil. This entry was posted in Ayurvedic Essential Oils, Essential Oils - Learn About and Purchase, Uses of Ayurvedic Essential Oils and tagged Ayurveda for mental strength, Ayurvedic health benefits of Nutmeg essential oil, Ayurvedic oils for brain power, ayurvedic oils for digestion, Ayurvedic oils for insomnia, Ayurvedic oils for pain, Ayurvedic oils for rhuematic pain, Ayurvedic remedies for inflammation, Ayurvedic remedies for memory power, Chemical constituents of Nutmeg oil, Essential oils for digestive problems, Gas Chromatography report of Nutmeg oil, Health benefits of Nutmeg essential oil, MSDS report of Nutmeg oil, Natural aphrodisiac, Natural remedies for digestive remedies, Nutmeg in Ayurveda, Oils for sleeping problems, Safety data sheet of Nutmeg oil, Therapeutic properties of Nutmeg oil by AyurvedicOils. Bookmark the permalink.